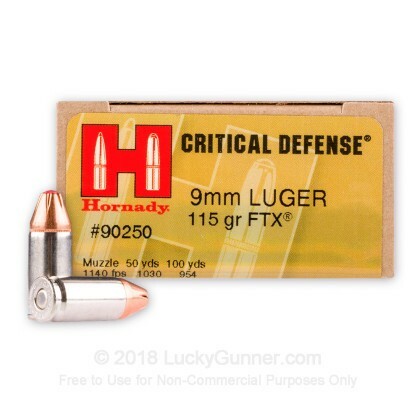 We test fired five rounds of 9mm Luger (9x19) Hornady 115 gr FTX Critical Defense into synthetic ballistic gelatin to observe its expansion and penetration characteristics. The ammo was fired from a Smith & Wesson M&P9C pistol at a distance of 10 feet. A four-layer barrier of heavy fabric was placed in front of the gelatin to simulate clothing. 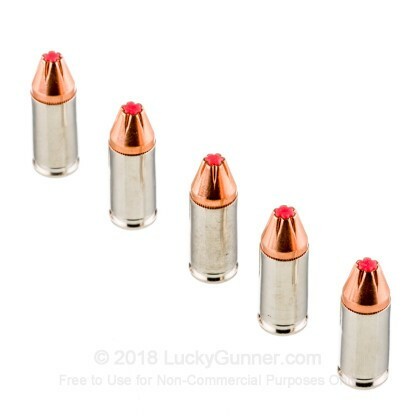 0.90" This ammo: 0.50" Min: 0.32" Median: 0.50" Max: 0.90"
13.3" 0" 5.6" 17.7" 47.5" This ammo: 13.3" Min: 5.6" Median: 17.7" Max: 47.5"
Good carry round, fired over three boxes through my walther CCP and zero malfunctions. Not the biggest expansion compared to HST and other popular rounds, but very consistent and never over penetrates. This is my everyday carry round 24/7, 365. Easy to control in the XDs-9 with good recovery for second and third round on target. Good penetration with outstanding consistent expansion. Empty mags ever six months at the range with no FTF or any other problems. Have matched a FMJ Hornady to qualify with every 90 days that are a perfect match. My Kahr CM9 feeds these with no issues at all. Comparatively some of the most consistent, reliable ammo on the market. May not be the best in every aspect but this ammo works. Performance is exactly as advertised. I've had 0 malfunctions with hundreds of rounds in 9x18 Makarov, 9x19 (Walther CCP) and .38 Spl and .357 Mag (Henry Big Boy carbine). Easily trust my families lives with this ammo. However please do not confuse Critical Duty with these rounds. 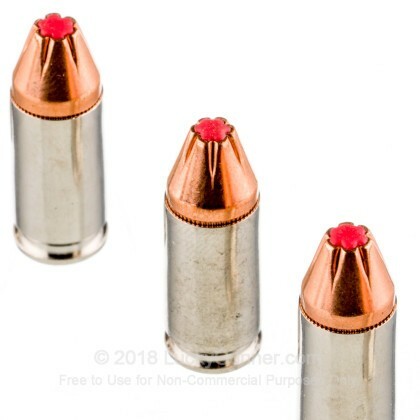 I USE HORNADY FOR ALL MY HOLLOW POINT NEEDS. GREAT AMMO FOR A 9mm WITH A 3" BARREL. For the different types of home defense ammo out there, this is one I decided to try early on. I find myself coming back to it because of the price. They expand every time, very reliable, and like I said before : price. Enough said. Fired 220 rounds through Glock 19 Gen 4 with no malfunctions. Seems to burn cleaner than other ammo I've tried. Excellent service - delivered within 2 days. The ammo works as advertised. No issues. Fired 25 rounds in my XD9 subcompact with no problems. One of less expensive cartridges with good results in Lucky Gunner's balistic gel tests. This is what my wife runs in her M&P9c. It goes bang every time and expands nicely when shot into appropriate material. 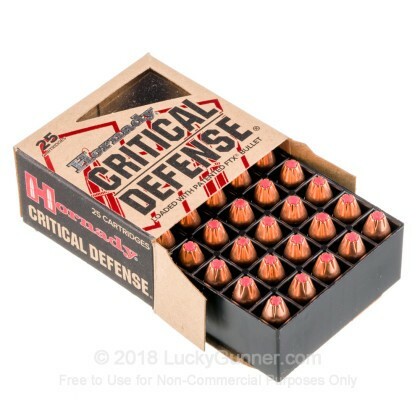 I've been impressed enough with how the Hornady Critical Defense runs in her 9mm and my .45, that I just loaded up on .380 for my mouse gun as well. excellent product, wished it was more affordable as i use this as my carry ammo, so must use 120 rounds each time to qualify. Good ammo, very little recoil and accurate. Love this ammo. Just wish was a little more affordable as I must qualify to carry and go through 120 rounds for my 2 9mm guns I use. Picked up two boxes, fired half a box at the range today in an XDS 9mm, and XD MOD.2. Both performed flawlessly and had noticeably more muzzle flash (almost hollywood style) than the other FMJ rounds we were shooting. Will continue to purchase these for home defense. I tried a box of 25 to see how it would shoot. High quality build, feeds well and shoots well out of my Beretta 92FS. Accuracy was very good. Would not want to be on the receiving end of that round! Recoil not an issue but BIG flash! More like a magnum flash than the usual 9mm. Perfect ammo for outside carry, but maybe not so much for home defense as the flash could be blinding at night. I may stick with Golden Sabre for that reason, but Critical Defense would be my second choice. As usual, flawless ordering and shipping experience with Lucky Gunner. Outstanding! service and quality at a fair price. I refer your company all the time. I am a loyal and satisfied customer. Thank you guys for all that you do for us. Fired flawlessly and accurately in my Ruger SR9C. 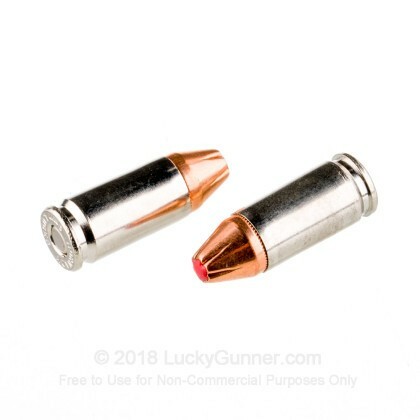 This will now be my carry ammo of choice. I have shot this round in several different sidearms (Ruger LC9; Sig Sauer P239; P226; Beretta 92 and Browning HiPower) it has performed well in all of them. The recoil is a bit excessive in the LC9 but manageable. Accuracy up to 25 meters (except with thre shorter barreled LC9) was very good with groupings under 3". Once again, a great blend of price and service. Great ammo...great service. This is my go-to supplier. Very good, quite accurate, feeds well and very reliable. That's why I use it. I purchased for home defense but shot 2 at the range. Very accurate, perfect functioning in my Glock 19. Clean burning too with no jams. I hope I never need to shoot these but am absolutely confident that it will take care of any Intruder. These were the first rounds through my new Sig P229 "Scorpion" Elite. They functioned very well in my weapon, and the only real question remaining for me is whether to use Critical Defense or Critical Duty for EDC. Have shot other defense ammo but will use Hornady from now on. Excellent stopping power for a bullet this size. Consistent pattern and flawless cycling in my Sars K2P. So l quit carrying that heavy .45. And 15 rounds are always better than 6. Love all the Hornady ammo and this is no exception. I had some of the critical duty but since I use it for defense I switched to this. Shoots great in my Ruger LC9. Not much more to say other than I hope to NEVER have to shoot this at anything other than my targets but IF I should ever need it for defense I know it will function perfectly. Also LuckyGunner is the best ammo supplier on line. You can see what they have and my ammo is at my door in just 2 days in almost every case. If you're looking for your every day at the range target ammo, find something else. These aren't cheap, but quality never is. But I always have a full clip of these in my Jericho whenever I leave the house and go anywhere. Also purchased a box for my sister, because when it comes to my family's safety I won't comprise, only the best will do. I'm a new gun owner, and found that a couple brands of 9mm JHP caused fail-to-feeds in my Walther P1, sometimes more than one per magazine. I won't mention the brands, because the problem is (seems to me) the wide flat nose profile of most JHP rounds on the market. The P1's feed ramp is narrow, so I thought the more pointy-nosed profile of the Critical Defense might help. Sure enough, I have had no FTFs with this ammo in my P1. So it's expensive, but worth it. I've made about a dozen individual ammo purchases from LuckyGunner and been very satisfied with the prices and order fulfillment. Clean burning and very accurate, functioned flawlessly in my SR9c and Smith and Wesson. A: Hi. Manufacturers use different varieties of propellant with varying burn rates. While the weight of the charge will vary in weight and amount depending on the type of powder in a particular run of ammo, the muzzle velocity will not vary very much at all from propellant type to propellant type. A: Hello Dom, Congratulations on the new gun! These 115gr. FTX rounds by Hornady in 9mm will work great in your gun. You shouldn't have any problems with functionality with them. These rounds will also not damage the rifling in your barrel aside from normal wear from shooting. 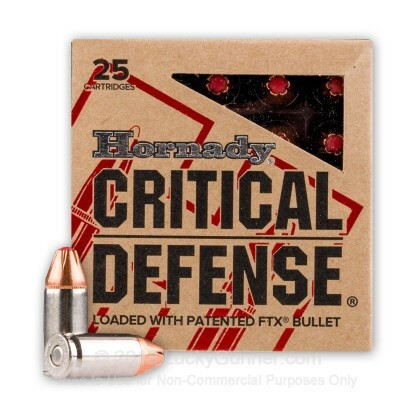 A: You should be good-to-go with Hornady Critical Defense in your Browning 9mm handgun. 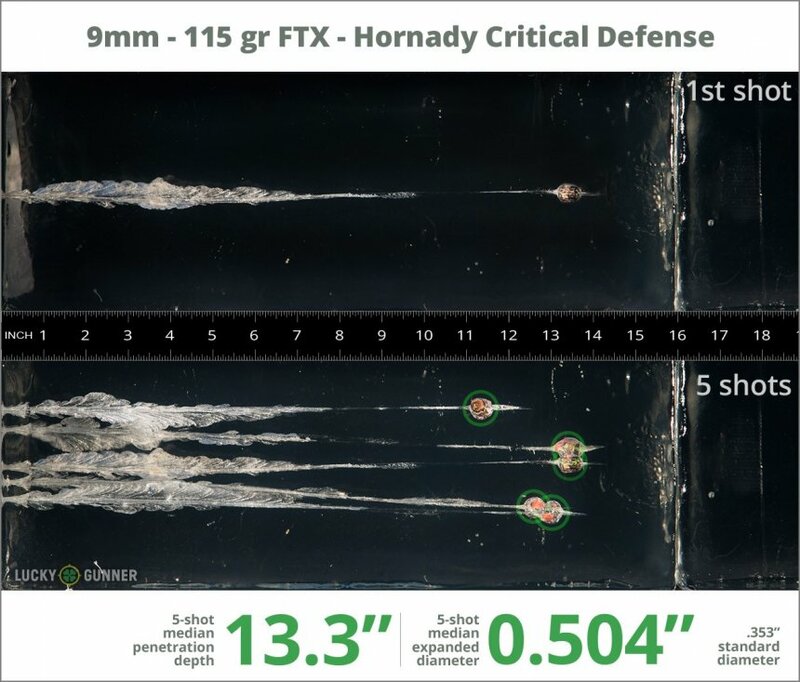 Hornady is a good choice and has a fantastic reputation among shooters for self-defense rounds. Thanks for checking in and good luck on your ammo hunt! We also have this 9mm - 115 Grain FTX - Hornady Critical Defense - 250 Rounds ammo in stock in a bigger quantity.